With summer 2013 looming on the horizon … somewhere, we hope, stores are starting to bring out their new collections of ice creams and ice lollies. Something I’m very glad to see is the wider introduction of mini versions of popular ice lollies, which means fewer calories. 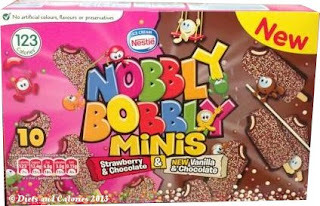 This week I purchased a box of Mini Nobbly Bobbly Ice Lollies. 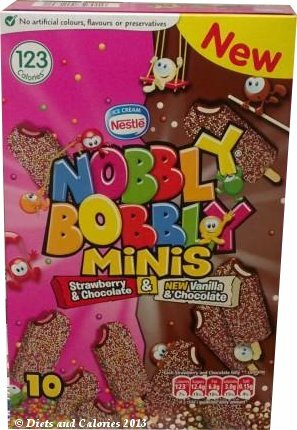 While the regular sized Nobbly Bobbly Ice Lollies are available in Strawberry & Chocolate flavour with 219 calories each, boxes of mini Nobbly Bobbly’s contain 5 Strawberry & Chocolate with 123 calories and a new flavour - Vanilla & Chocolate which has 121 calories. Now, these are not something I eat myself. If I haven’t made some healthy dessert, then my family like nothing better than grabbing an ice cream out of the freezer after dinner. As such, I try to make sure the ice creams I buy aren’t too calorific. For this reason, I’ve never actually bought Nobbly Bobbly ice lollies before, simply because I think 219 calories for a ice lolly is too much. But, the mini sized version with 121 or 123 calories is much better. OK, they’re not exactly healthy, but in small amounts, as part of a healthy diet, then why not enjoy them. The whole family love these, especially the sugary bobbly bits on the outside. They also like the ice cream centre. Favourite flavour – the new vanilla and chocolate. Nutrition good points: no artificial colours, flavours or preservatives. And the not so good: high in sugar and saturates. Nutrition Information per strawberry & chocolate lolly: 123 calories, 1.2g protein, 14.0g carbohydrate, 12.4g sugars, 6.8g fat, 3.0g saturates, 0.3g fibre, 0.15g salt. Suitable for vegetarians.